The park consists of a closed bowl, a street course and a beginner’s area, all of which can be used separately or as one on quieter days. The bowl has a straight section or ‘mini-ramp’ with an escalating pocket, a large steep flat bank extension and a clam shell extension. 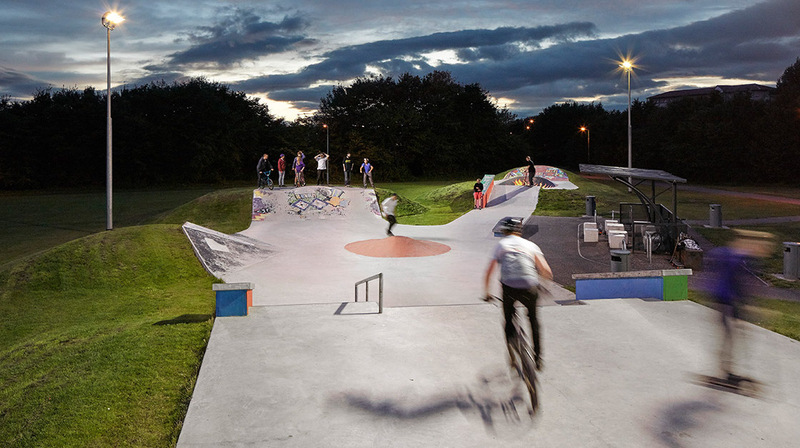 The back of the step bank extension becomes a platform for the bowled out micro quarter pipe that gives speed for the street course level change. The beginners section has a half penny bank and a small, dipped roll-in bowl with curved spine that leads to a kicker wedge with hubba that links back to the main street course.